At our collision repair center in Burlington, we use some of the latest machinery and tools to restore your vehicle back to its original state. If you want to make sure your vehicle is getting the best attention possible, be sure to bring it into R.P.M. Performance! We are the first shop in the Northwest to have this high tech welder. 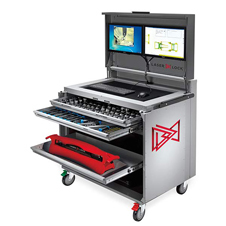 It is the most advanced welder available on the market, and it carries many OEM recommendations. 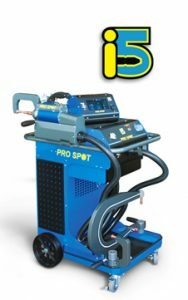 The new Pro Spot SP-5.3 SMART Double Pulse MIG welder is a three-phase welder with microprocessor controls. Proven to provide excellent welding performance on any material of any thickness, regardless of weld time. 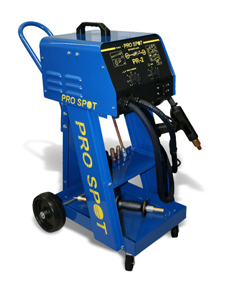 This is the resistance spot welder recommended by FCA, Ford, GM and several other manufacturers for properly duplicating their spot welds. 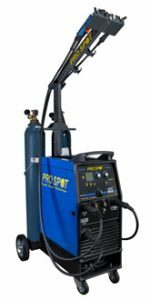 Pro Spot’s i5 SMART Spot Welder features a new medium frequency trans-gun capable of delivering 14,500A with 1,243 lbs (565 daN) of electrode force. The i5 is designed to handle all new ultra-high-strength steels including Boron and others. The PR-2 Welder is a highly versatile system that allows the user to weld multiple fasteners from the OEM. The PR-2 is able to perform many single-sided welding functions, including stitch welding, washer welding, nut and bolt welding, nail welding, moulding clip rivet welding, and Pro Pull dent pulling. This is the largest and most capable car, SUV, and light duty truck bench on the market. At 22 feet long and 92 inches wide, the Goliath can easily handle the biggest and baddest pickups, extended-cab dualies, and SUVs around. 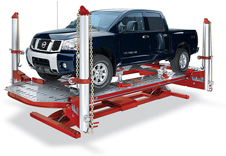 The Goliath is the longest and strongest passenger car and truck pulling system Chief has ever produced. LaserLock Live Mapping is our highly advanced frame measuring system with multiple OEM manufacturer approvals. The key is the newly designed body scanner, which locks in 45 predefined high-tech targets in real time. New technology means no vehicle leveling is necessary, so technicians will deliver on-the-money reports every time. LaserLock’s proprietary software helps identify incorrect pull setups before they are made in order to to prevent additional damage from being inflicted on the vehicle and to speed up the repair process. When your vehicle needs body work performed by the most experienced professionals in the Burlington area, contact us at R.P.M. Performance today. What Does a Collision Repair Shop Do? If you have been involved in a car accident, you know just how confusing it can be. After the dust has settled, it is hard to know exactly what to do with your damaged SUV, truck, or car. If you have questions, your best bet is to contact a collision repair shop. They will be able to tell you what you can do to have your car repaired and why it is so important to have your car checked over even after a minor fender-bender. Get in touch with R.P.M. Performance in Burlington today if you have questions about how we repair body damage to your car. We have years of experience and the most up-to-date equipment that will ensure the repairs we make are safe and lasting. Keep reading for more information about what we do when you bring your car in to our shop and then give us a call to set up an appointment. Modern automobiles are engineering marvels. Where older vehicles had steel frames that could survive most impacts with minimal damage, today’s vehicles feature frames that may be made from other, lighter materials that help to absorb the impact of an accident in order to protect the people inside the vehicle. While this helps these cars be safer, it also makes repairs more difficult and costly. Luckily, at R.P.M. Performance, we can evaluate the damage to your vehicle quickly and accurately and let you know what it needs. Collision repair is not a single process. Instead, it is a combination of multiple processes that, when combined, turn a damaged, unsafe, ugly vehicle back into a safe and great-looking truck, SUV, or car! When we provide you with an estimate, it will clearly state what needs to be repaired, how long we expect it to take, and the cost. When we get your approval to move forward, we will order any specialty paints or parts that are needed. Our collision repair facility allows us to perform all necessary work in a clean and safe way. Thanks to our mapping system and frame rack, we can precisely track and perform each pull, and our welders allow us to make clean, strong welds. While the body and frame work is being done, our painters are busy prepping and painting the parts of your vehicle that were scratched up, dented, or otherwise damaged. When everything is finished, we put the vehicle back together and ensure that everything is up to our incredibly high standards. When all the work is completed, you almost won’t be able to believe how amazing your car looks. Call us today when your truck, car, or SUV needs minor or major body repair work. Our technicians have the training and the experience that will turn even the most damaged vehicle back into something you are safe and happy driving. If you need truck accessories, a Line-X bed liner, wheels, tires, or custom paint, we are always here and ready to help!